Kitchens that look professional but can be personalized with smart storage, painted cabinets, appealing finishes, handsome appliances, and elements of industrial style, such as Kohler’s Tournant faucet, are popular with today’s buyers (All photos courtesy manufacturers). 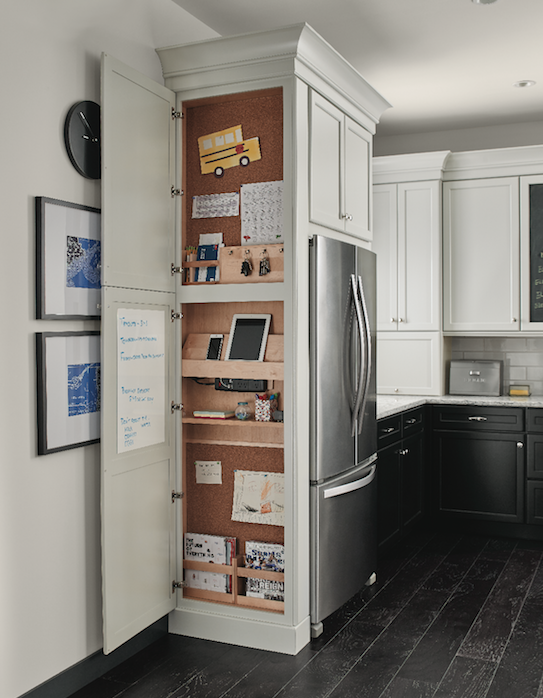 The trend toward personalization is only bolstered by the kitchen being the home’s hub. “The kitchen keeps growing,” Steinke explains. 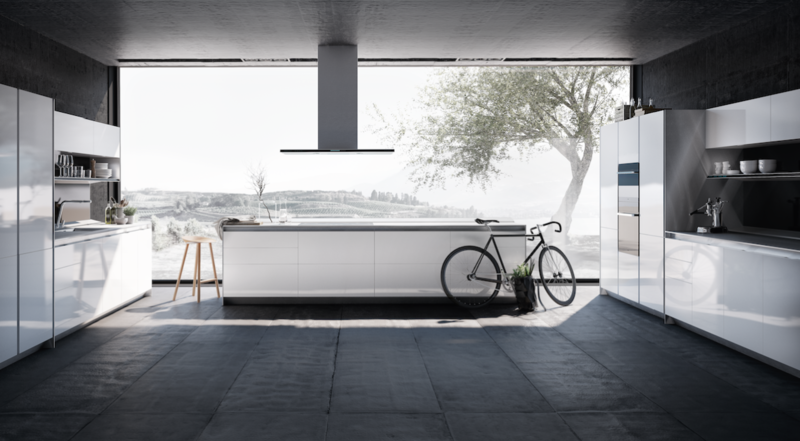 “With more products like wine storage, commercial-style ranges, and built-in espresso makers, the kitchen needs to expand to hold all of the appliances. The island needs to seat at least four and have ample working space.” The kitchen is where most groups tend to gather, he adds, so staying current is crucial. Larger kitchens may still be a trend, but many buyers, including those who downsize as they become empty nesters, seek smaller, more affordable spaces. 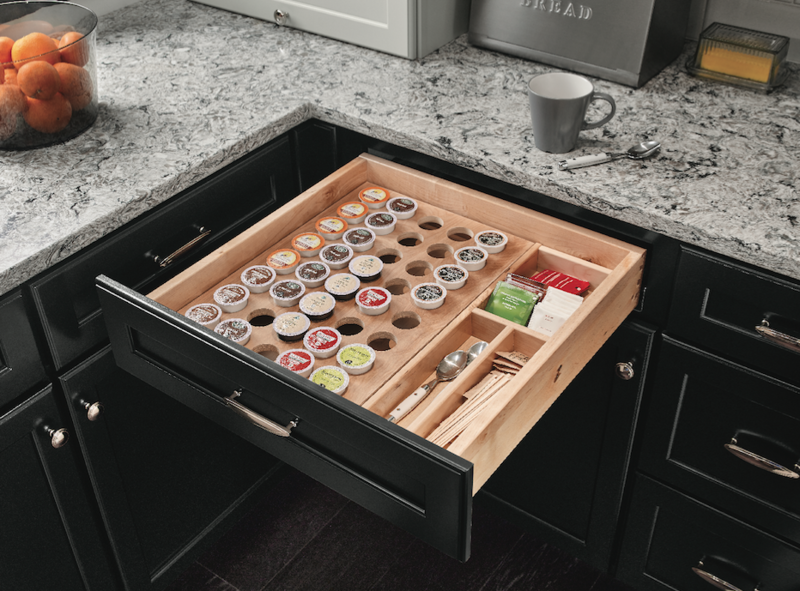 “We have seen a trend in consumers asking for more practical storage options, but with less cabinetry space,” says Angela Wellborn O’Neill, director of marketing and advertising for Wellborn Cabinet, in Ashland, Ala., who attributes the trend to a new generation of young homeowners seeking smaller properties. 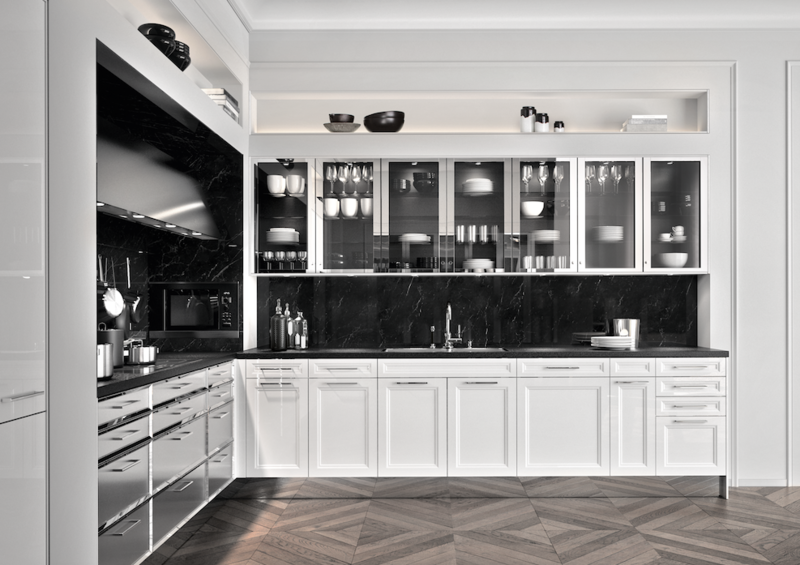 In cabinets, white endures, from modern to traditional styles. 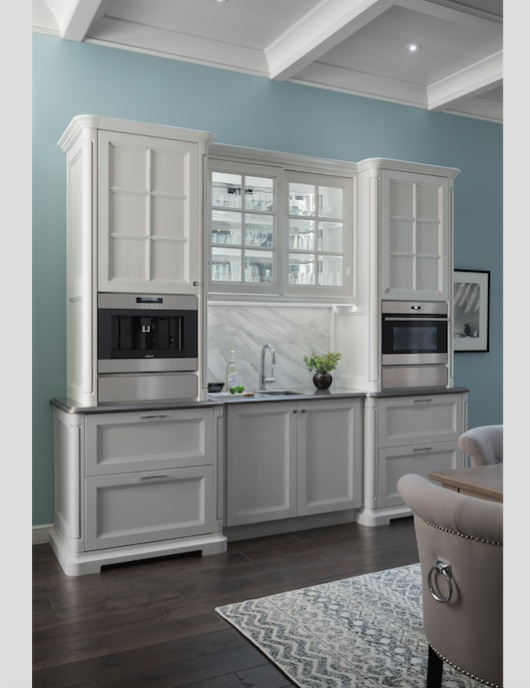 Alexa Noel, senior manager of innovation and research for Ann Arbor, Mich.-based Masco Cabinetry, which counts KraftMaid and Merillat among its brands, says most popular are classic white and off-white finishes on streamlined door styles. 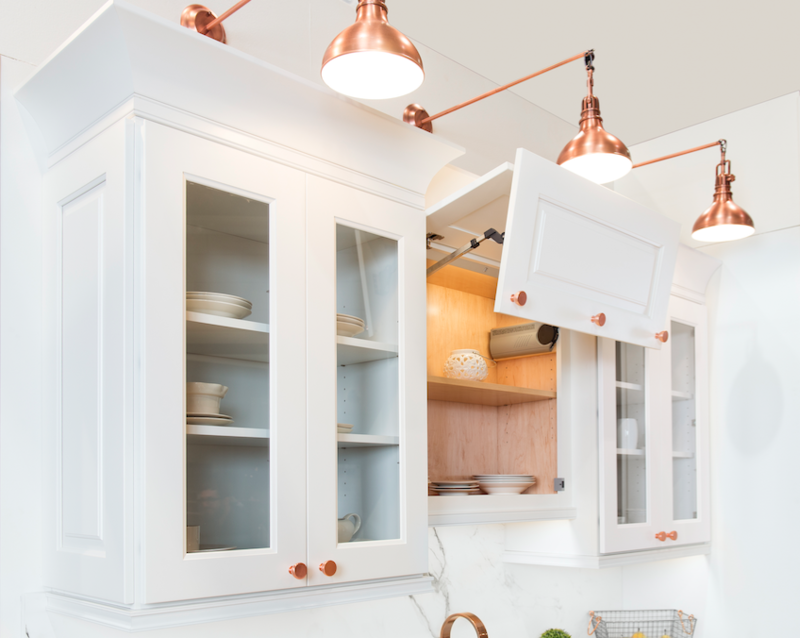 John Troxell, director of design at Wood-Mode, in Kreamer, Pa., advises that there are many variations of white, and that painted cabinets are by far the biggest trend in kitchen cabinets to date. Wellborn’s sales data support that: More than 50 percent of the company’s annual sales are painted cabinets and 80 percent of them are requested in some shade of white. 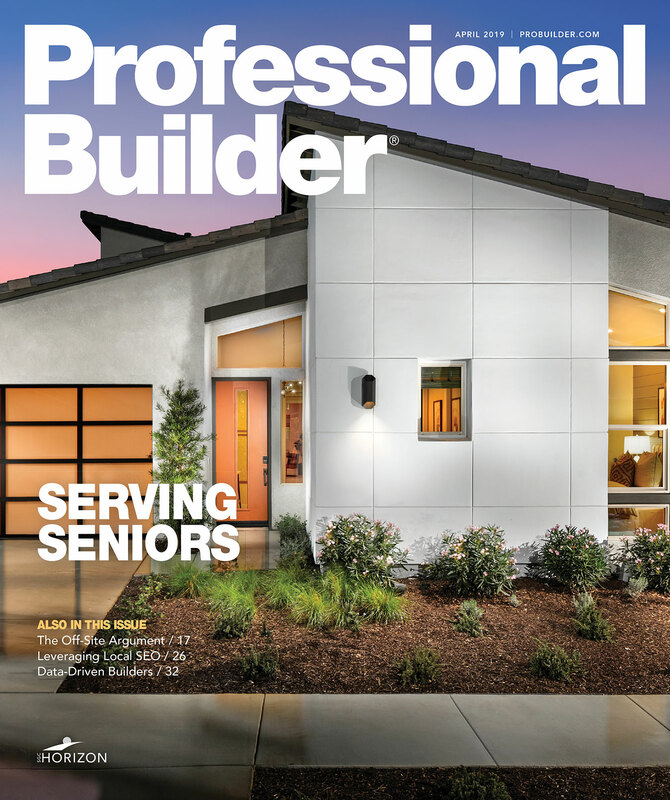 Troxell adds that gray is also a leading color for solid finishes as well as wood stains. Cabinets in the most popular color—white—from Wellborn Cabinet mixes door-front styles and heights to increase visual interest. Noel is noticing a growing trend in textural finishes as a way to add visual interest and as a response to streamlined design. 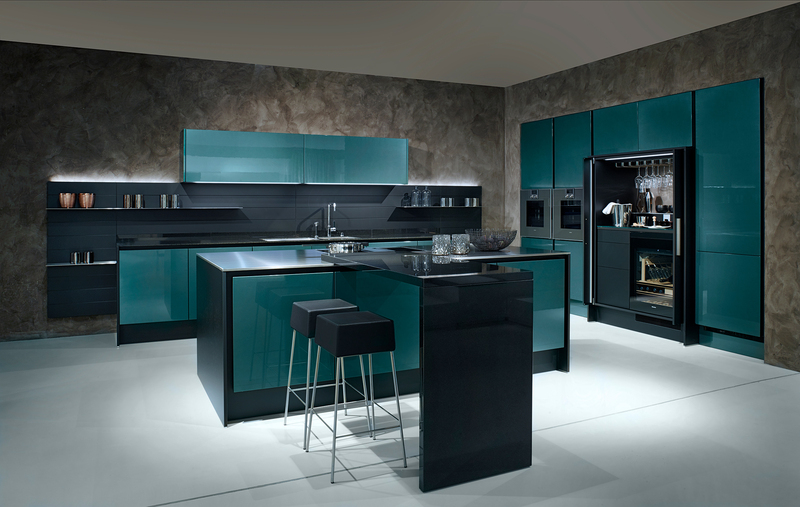 This year, KraftMaid is adding two unique finish techniques, Aged and Translucent, which provide textural options in trend-forward colors. 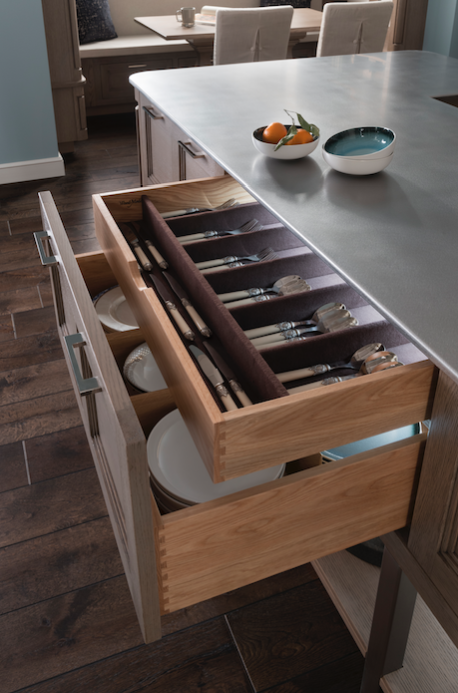 Beyond finishes, Noel says, “We see homeowners wanting smarter storage in their kitchens, not necessarily more or less cabinetry. They want to spend as much time as possible in their new kitchens, so supporting activities like homework, crafts, and family organization is important to organizing and maintaining their new space.” KraftMaid’s Utility Message Center answers the need for a compact place in which to organize bills, leave notes, and charge electronic devices. 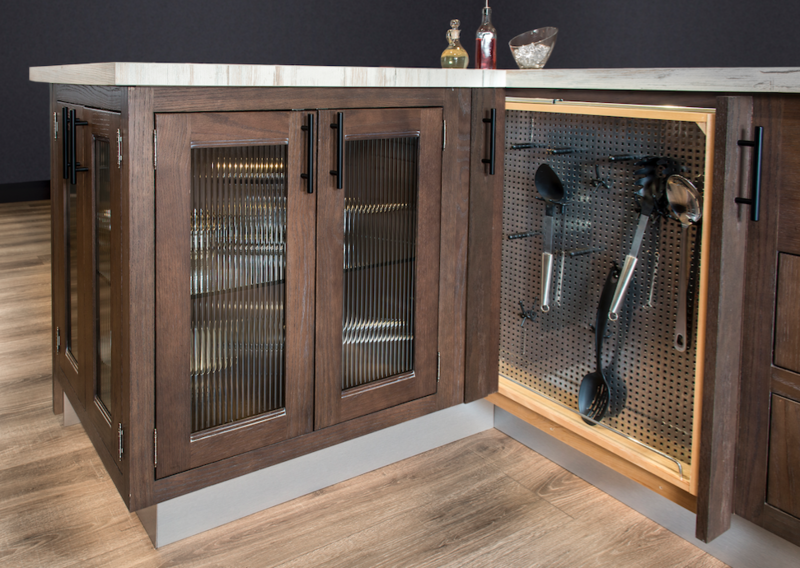 In tandem with this trend is an increase in cabinet accessories, such as roll-out towel racks, spice drawers, drawer organizers, and, for serious cooks, a hydraulically assisted stand-mixer shelf for a stand mixer that tucks away in a lower cabinet or can be raised to working height. Miranda Valentino, senior product marketing manager for Electrolux, in Charlotte, N.C., notes that as stainless steel has become more affordable in the marketplace, its popularity endures. 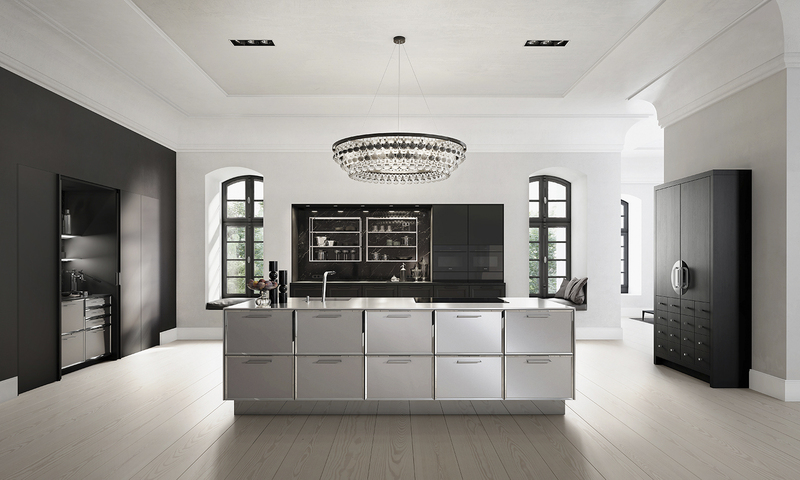 She says that the new trend of black stainless steel now makes up 5 percent of kitchen sales, with Millennials being the prime buyers. 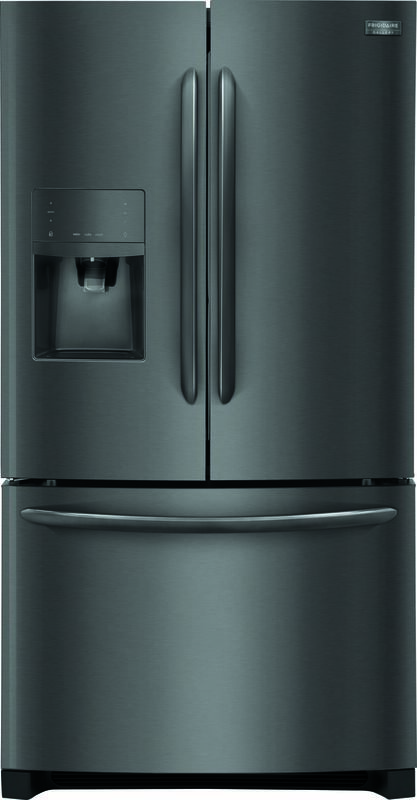 According to Lee Lagomarcino, marketing director of refrigerator products at GE Appliances, in Louisville, Ky., one-third of shoppers prefer stainless, one-third matte, and the remaining third opt for high-gloss finishes such as black stainless. 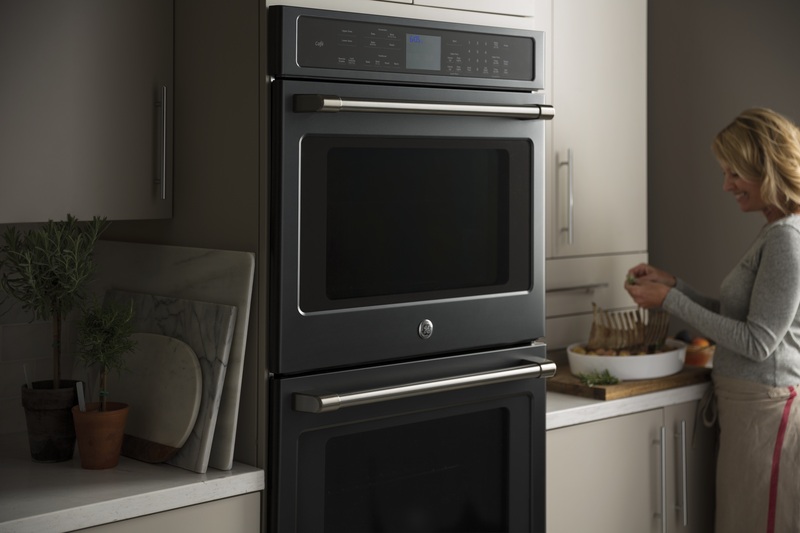 GE has introduced a Black Slate finish, a matte charcoal that coordinates with stainless steel and hides smudges. 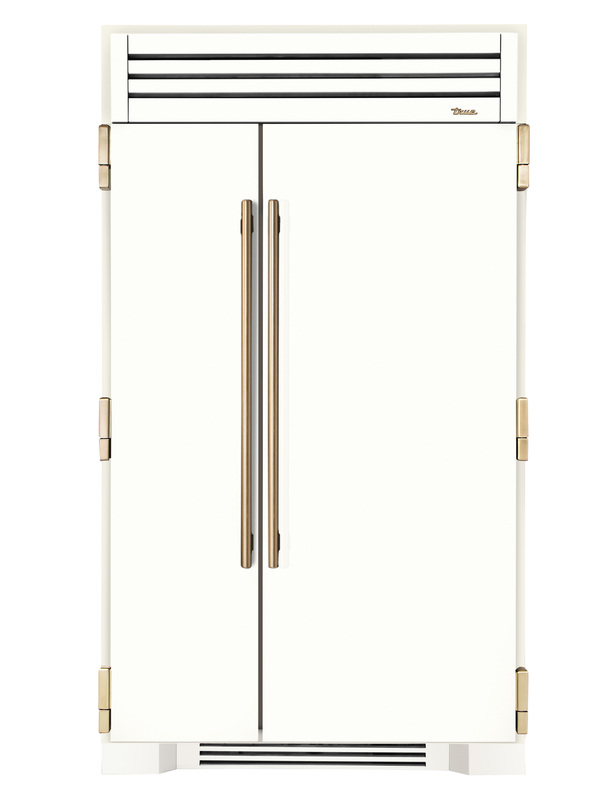 From Blomberg, part of Beko US, this 36-inch-wide French door refrigerator uses continuous blue-light rays that illuminate the crisper and allow photosynthesis to continue, prolonging fruit and vegetable storage life and preserving natural flavors and nutrients. The amount of cooking and entertaining done in the kitchen dictates size and quantity of appliances. 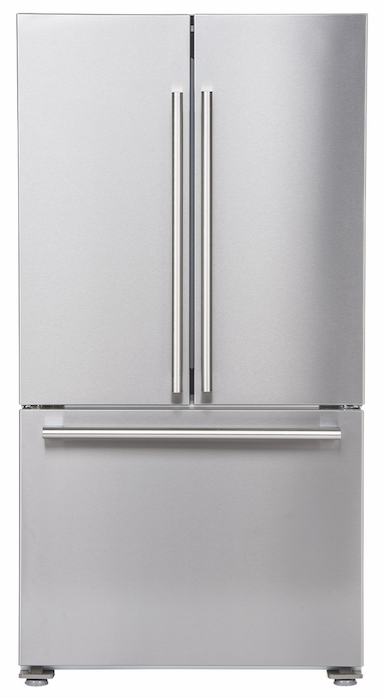 Steinke sees most buyers opting for 36-inch-wide counter-depth refrigerators, and notes an increase in second refrigerators in kitchens. A wine fridge is included in almost every house that Infinity builds. Some builders note that induction cooktops are gaining in popularity. 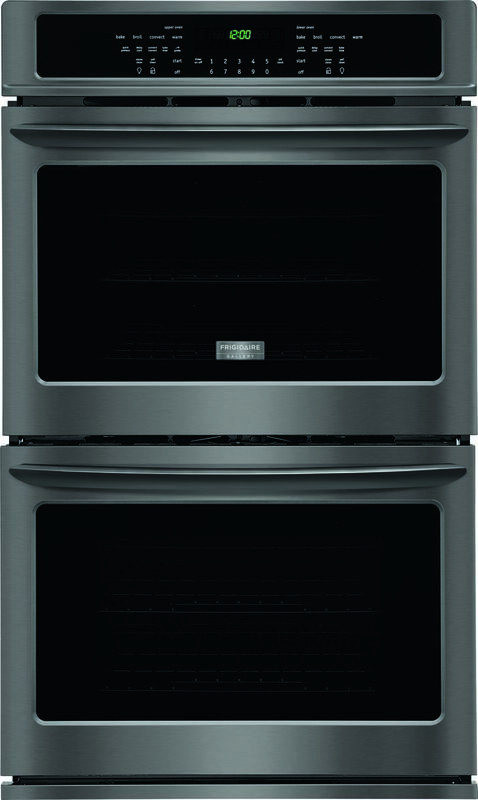 Frigidaire Gallery will be adding a freestanding induction range later this year. 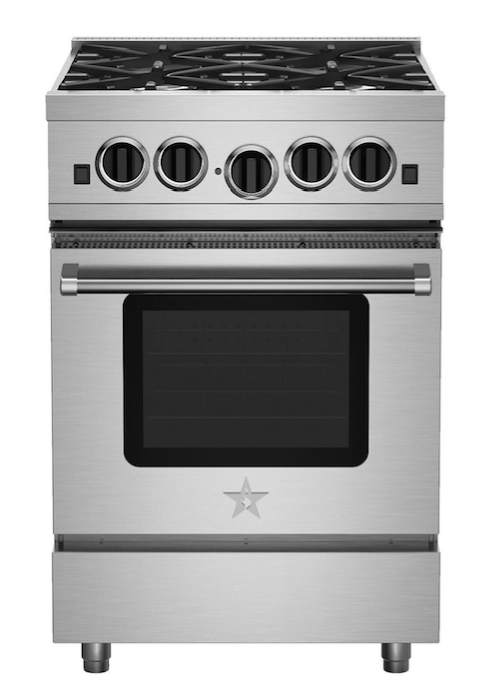 “[Induction cooktops] can boil water in under a minute and they have digital displays and controls,” Steinke says. “With the added safety benefit of induction—over open flame or exposed burner—we see a lot of these installed in homes with young children.” But the electromagnetic technology has yet to take off in the mass market. 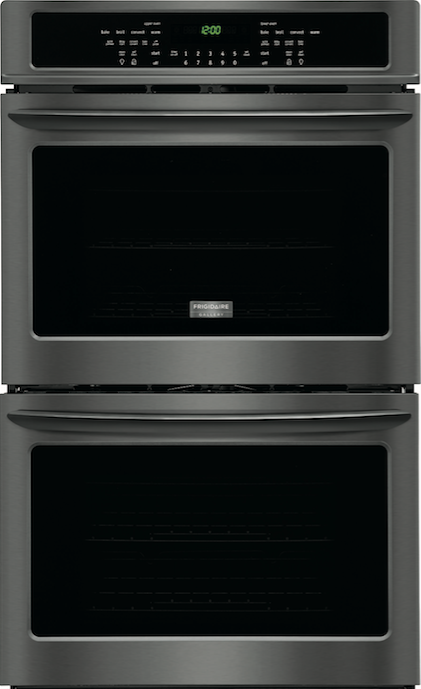 The Frigidaire Gallery Double Wall convection self-cleaning ovens (left) are offered in the new Black Stainless Steel finish. 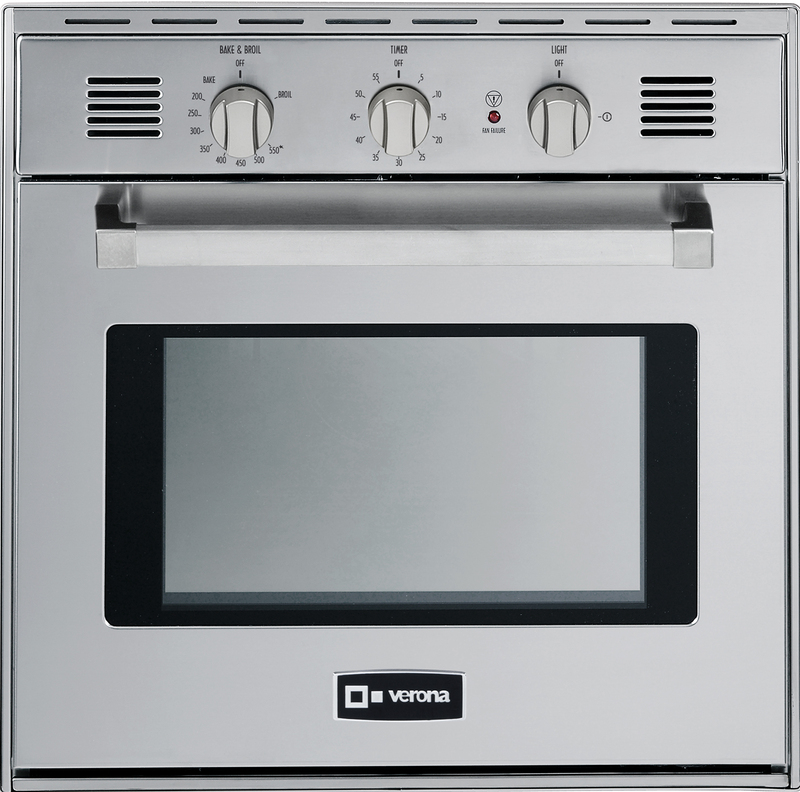 Other features include a quick-preheat setting and a temperature probe that provides an alert when food has reached a preset temperature. McClelland agrees on the popularity of apron fronts, while Steinke says demand has slowed. Experts’ opinions vary on the most popular sizes for sinks. For McClelland at Toll, the 33-inch-by-22-inch sink is most common, but 36-inch-wide sinks are increasing in demand. 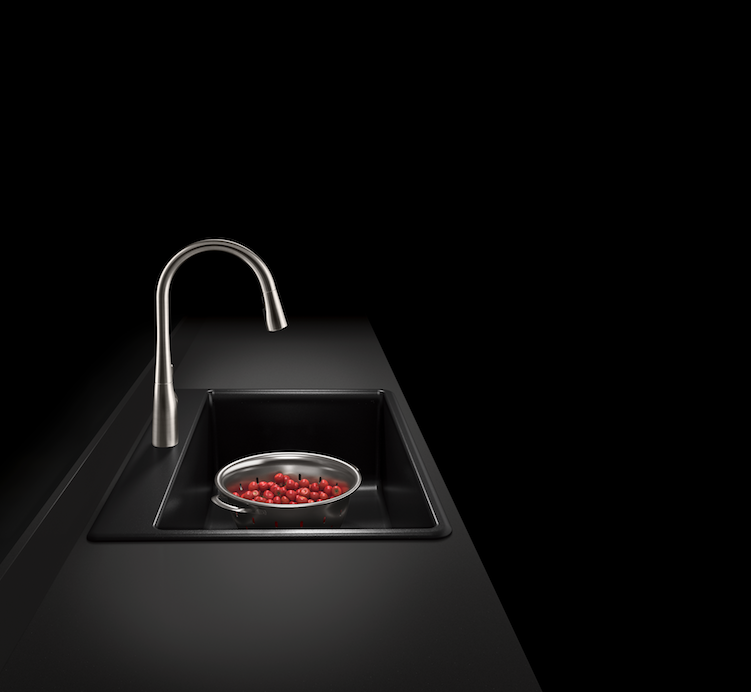 Steinke holds that the 30-inch-wide stainless steel sink remains the leader, in mostly contemporary square designs. McClelland sees a balance in popularity between cast iron and stainless steel, as well as a rise in resin composite sinks. 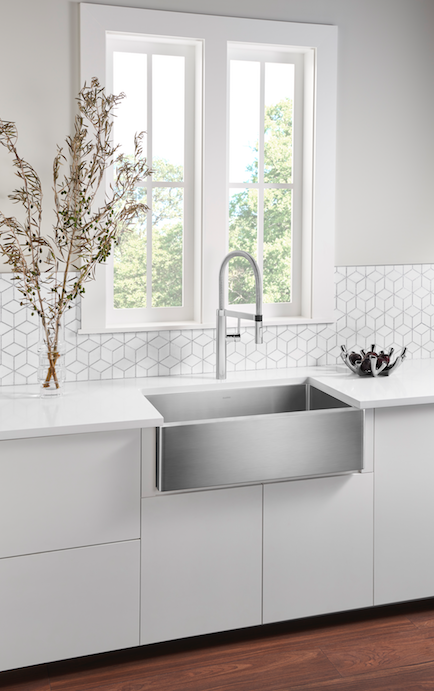 At Blanco, stainless steel sinks are still going strong, especially in contemporary-style kitchens, with single-bowl models trending. A sink that’s big enough to fit an oversize roasting pan or a wide stockpot is a boon, of course, for serious cooks. From Blanco, the Quatrus R15 satin-finish stainless steel single-bowl sink has a wide corner radius for easy cleaning. The apron front measures 32 by 2 by 9 inches. The company notes that having a large sink near the cleanup area and a bar sink in the cooking area is a continuing trend. 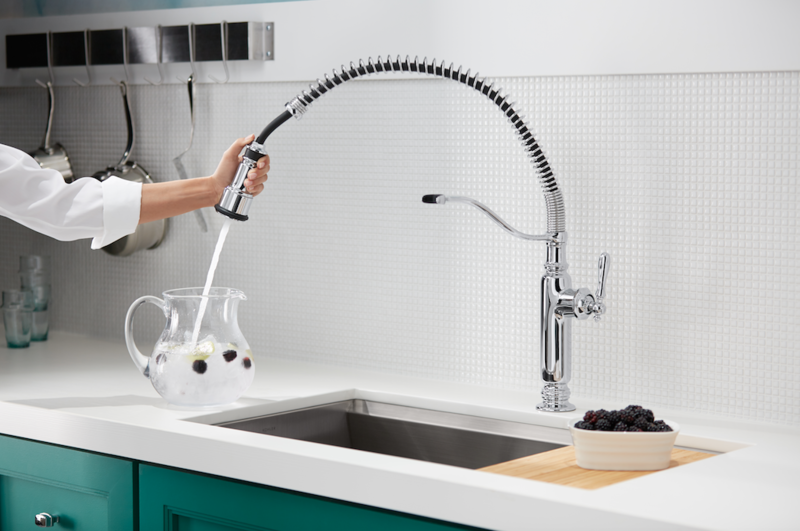 In faucets and fittings, Peggy Gallagher, product manager–trade kitchen for Delta Faucet in Indianapolis notes that stainless is the most popular kitchen faucet finish, followed by chrome, with matte black and gold tones rising in contemporary-style kitchens. 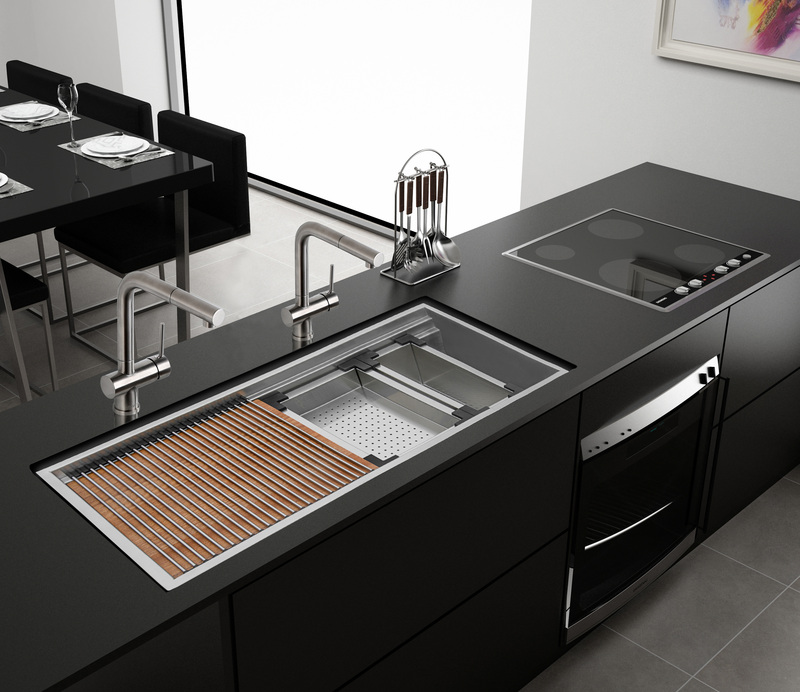 To dovetail with the interest in black stainless steel appliances, Delta is introducing its new black stainless finish at the end of 2017. 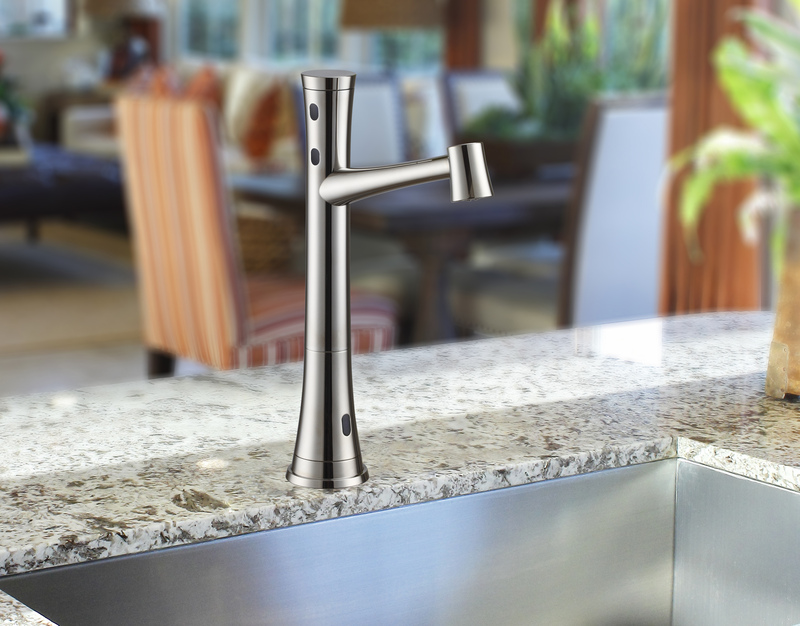 Pull-down and pull-out faucets, as well as commercial pull-down faucets, remain the fastest growing categories, according to Gallagher, who notes that industrial and mid-century designs are emerging trends. 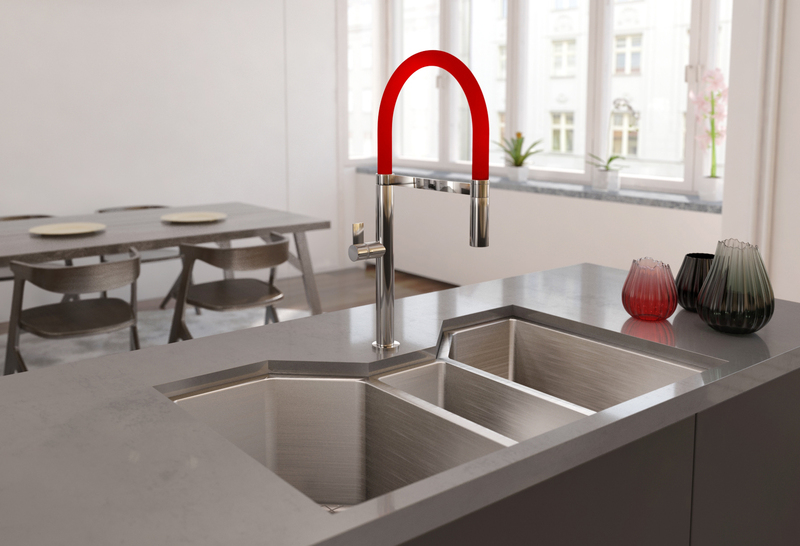 Touch technology, which activates water flow with the tap of a hand rather than moving a lever, is popular in many faucet lines today. New spray technology offers a concentrated water jet for power washing, while a protective shield of water contains any splatter. Gallagher says this technology will be incorporated into five Delta kitchen collections by the first quarter of 2018. Wanda Jankowski, a writer based in New York, covers design and products, and is the author of several books. 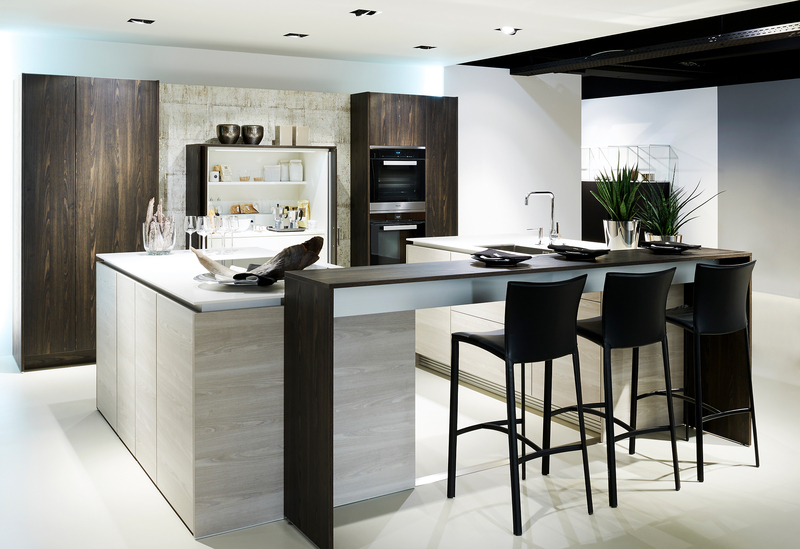 Want to see more on-trend kitchen products? Click on an image below to view the slideshow.